Men have built themselves societies, developing on every aspect of life. After centuries of continuous evolution, we have come to improve our settlements by equipping cities with all forms of comfort. Today we can easily have access to both work and entertainment sources. An example worth to be mentioned is a symbol for good taste and culture: the philharmonic. The city of Iasi, which is the cultural capital of Romania’s region, Moldavia, concentrates a full package of elements that represent art in all its forms. 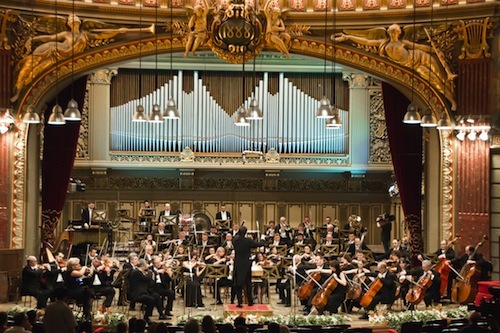 Among valuable examples such as the Romanian National Theatre or the Romanian National Opera, Moldova State Philharmonic comes to complete a long number of important entertainment sources that the inhabitants of Iasi are right to take pride in. This institution with permanent artistic activity emerged in 1918, wearing the name of the illustrious Romanian musician, George Enescu. Its inaugural concert took place on the 9th of October, 1942, and it had as first director Radu Constantinescu. During its first decade, the symphonic orchestra of Iasi has built its rich repertoire as a basis of its future personal interpretative style. 1953 is another year that marks an important moment in the Philharmonic’s evolution, being the time when the choir was created. Is wears the name of the great Romanian composer and bandmaster Gavriil Musicescu, and it made possible the interpretation of famous works of Mozart, Haydn, and Carl Orff, which were performed in the city of Iasi for the first time due to this talented group. The year 1962 brings at the leadership of the orchestra the young bandmaster Ion Baciu, who managed to create in time what the master Elenescu named to be “a symphonic team”, while the musicologist Iosif Sava called “Baciu’s Stradivarius”. The centenary of George Enescu’s birth constituted the perfect occasion for Baciu to prove his incredible talent as a composer, orchestrator, director, and stage designer during the remarkable interpretation of Enescu’s masterpieces in a concert held in Bucharest, 1981. The success goes on with representations across the border, Moldova State Philharmonic of Iasi reaching famous places such as Macerata (Italy), Amsterdam, Nurnberg, Grieg Hall in Norway, Gaveau from Paris, Madrid, Leipzig, Zurich, Munchen, New York, Washington, Chicago, San Francisco, Toronto and many others! It has been almost 2 decades since the symphonic orchestra participates at the International Contest “Grand Prix Callas” in Athens. After leading the Philharmonic on the heights of glory, Ion Baciu leaves Iasi and his position of bandmaster in 1986. However, the orchestra has maintained its professional level, giving in 2003 the title of “Principal Guest Conductor” to the Italian bandmaster Michele Santorsola, who became permanent staff in 2008. The same title was also given to the American bandmaster Paul Nadler, while in 2004 the young bandmaster Mark Mast from Germany received it too. Today, the symphonic orchestra counts 86 permanent members and 20 collaborators, while the academic choir “Gavriil Musicescu” covers 65 members and 10 permanent collaborators. Moldova State Philarmonic of Iasi has firstly activated under the roof of an important edifice, the house of the Romanian treasurer Alecu Bals, a historical and cultural place with beautiful architecture, where many artistic manifestations of the time used to take place. A relevant example is the first play in Romanian that was performed here, for the first time in Iasi, in 1817, or the concert held in 1847 by the great pianist and composer Franz Liszt. However, in 1957 the main building on Cuza Voda Street was inaugurated the Concert Hall of Moldova State Philharmonic of Iasi. Ever since that moment, this institution activates there, and it holds one of the most beautiful and acoustically qualitative concert halls in the country. Next Post Next post: You Are A Woman, You Are Beautiful, You Are Perfect!